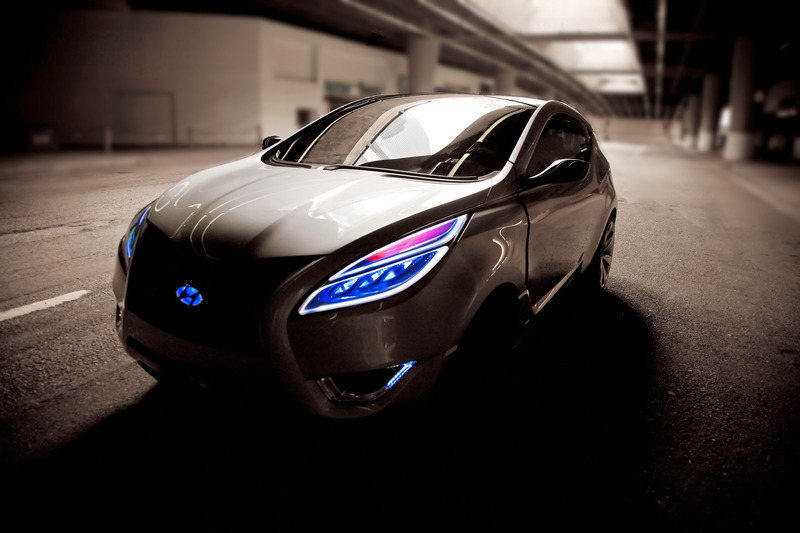 The Hyundai Nuvis Concept is the eleventh signature concept car to be designed at the company's California Design Center in Irvine, Calif. In addition to showcasing the brand's cutting-edge capabilities, Hyundai Nuvis Concept also hints at a possible design direction for a future-generation crossover, blending attributes of a tall urban car and a premium utility vehicle. 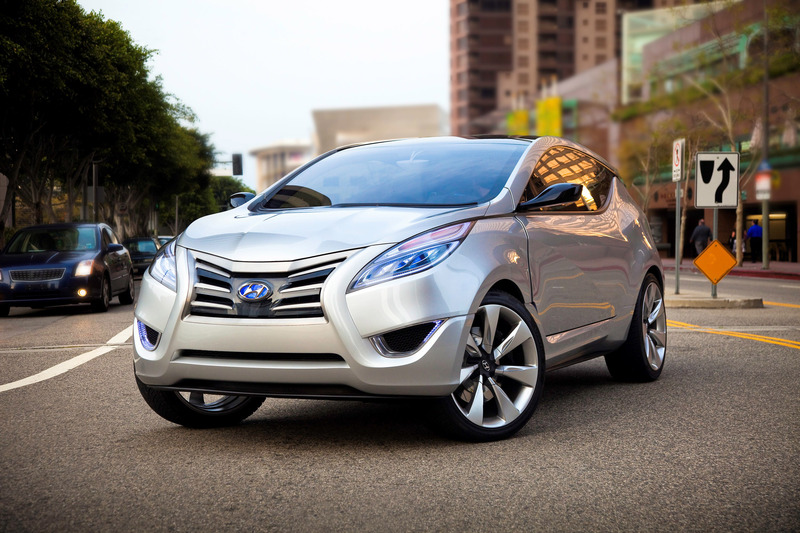 Consistent with Hyundai's pledge to lead all brands in U.S. fuel economy by 2015, Nuvis is powered by Hyundai's Hybrid Blue Drive architecture, which uses breakthrough lithium polymer battery technology. In developing the initial sketches, Hyundai designers considered the interplay of natural, fluid elements with more rigid surfaces and structures to create the illusion of constant motion. Specifically, designers studied the way water splits across and flows around the hull and sides of a boat, creating a wake, or the way wind shapes a snowdrift or flurries through trees. The living power of these elements is reflected in the Nuvis' design. 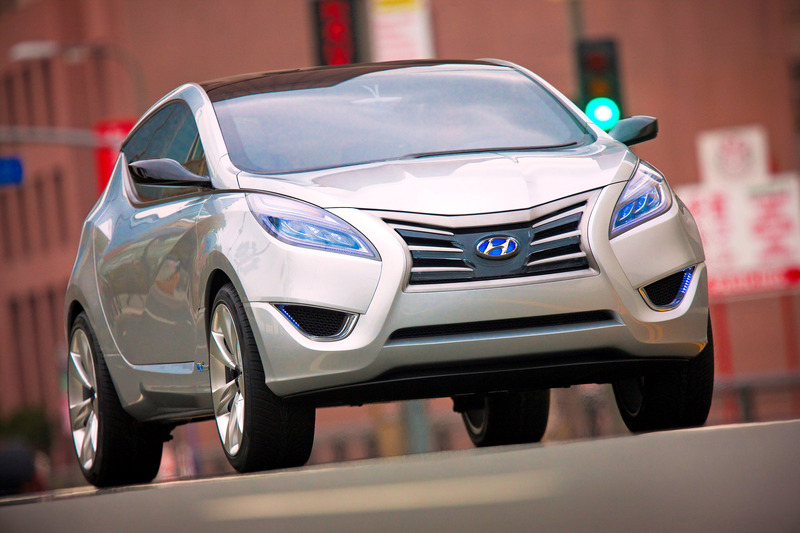 "Our goal was to create a living machine, constantly moving, that the driver and passengers could be part of," said John Krsteski, Hyundai Design manager. "There are no lines on or in this car that are standing still." In addition to invoking the impression of irrepressible motion, the Hyundai design team took more practical matters into account as well. 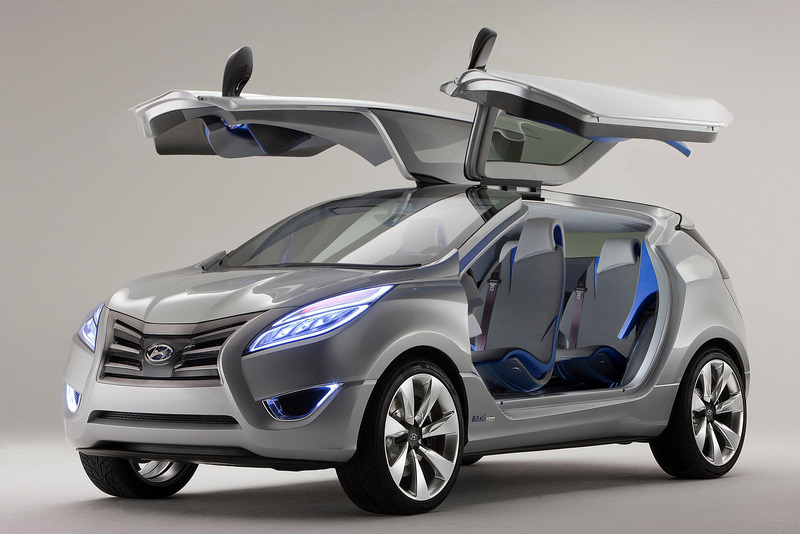 Hyundai Nuvis Concept is designed to accommodate the diverse interests of a modern, active couple. The Nuvis is meant to be comfortable starting its day at a desert retreat, arriving at the ski slopes in the afternoon and then cruising to a formal dinner that evening. 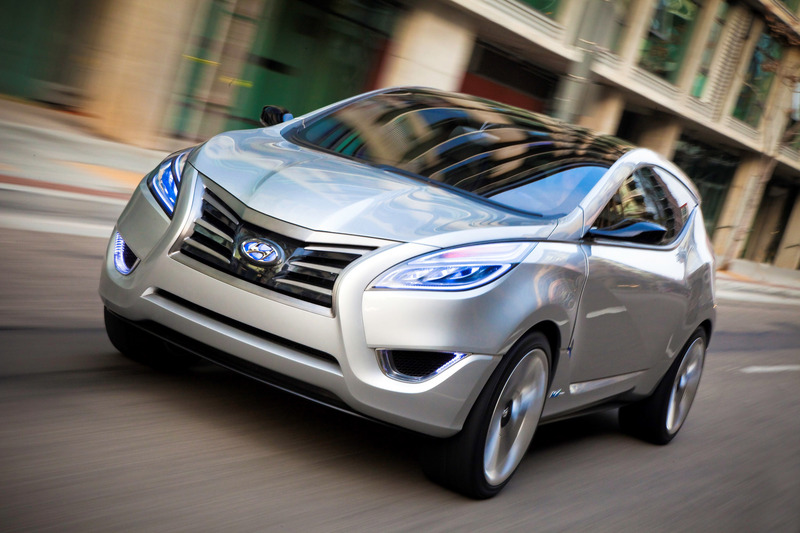 The design team sought to create a vehicle that would complement its environment, without making a negative impact. 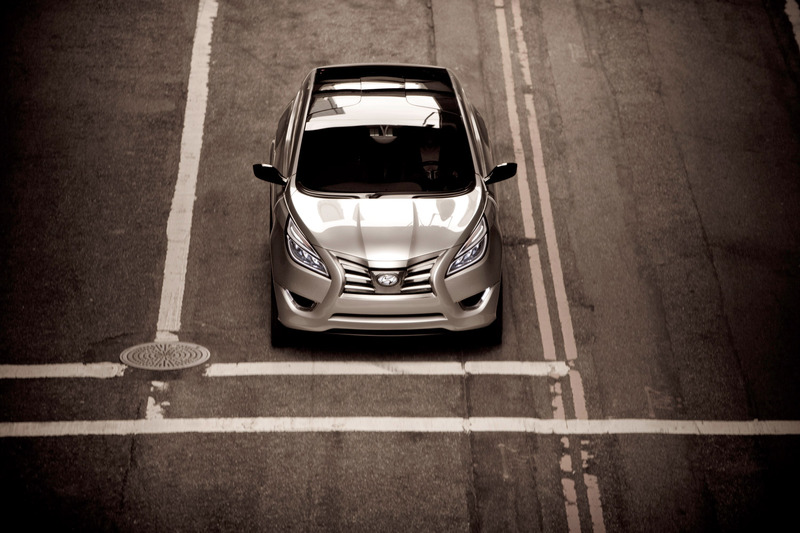 The versatility of the vehicle's design, combined with Hyundai's Hybrid Blue Drive technology, accomplishes exactly this. 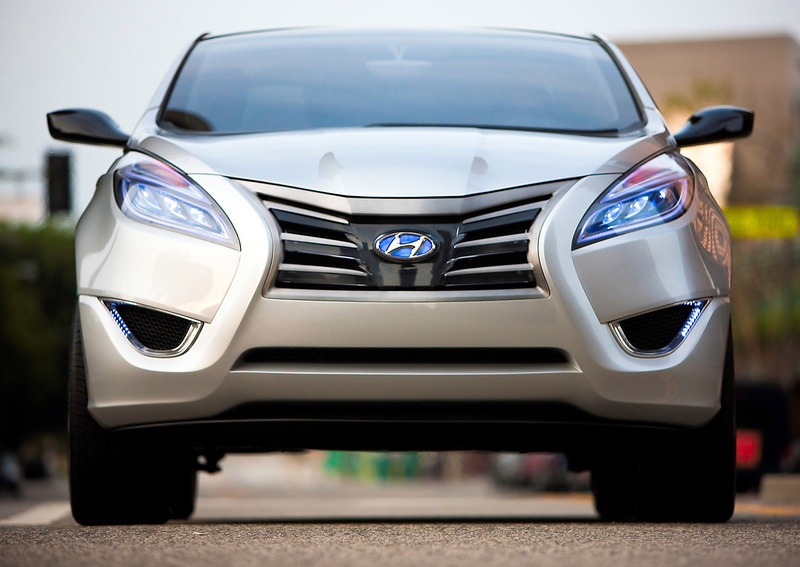 The Hyundai Nuvis Concept has an assertive face demonstrated by the strong, hour-glass shape that frames the blue acrylic shield grille and aggressive headlamps, whose two glowing white rings are offset by a pair of red rings on the tail lights. 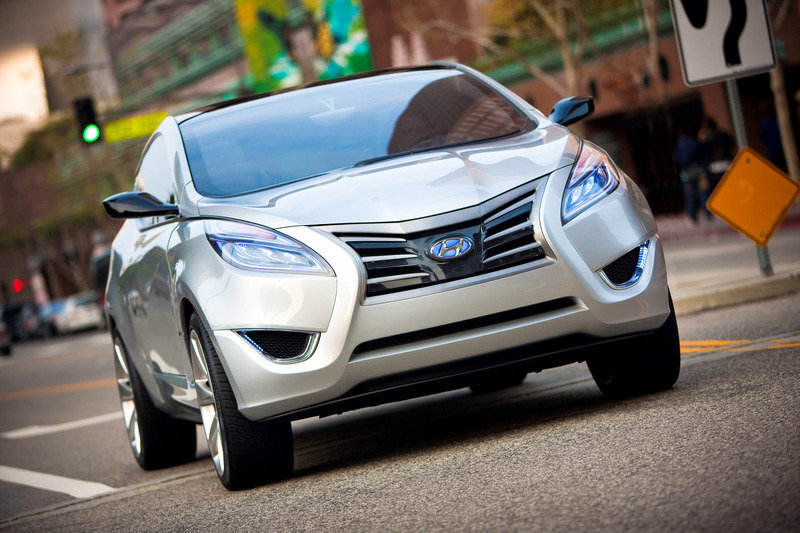 Perched on top of 22-inch wheels, Nuvis' proportions are tall, strong and protective. The two body-side lines set up a flowing water effect, giving the appearance of motion. 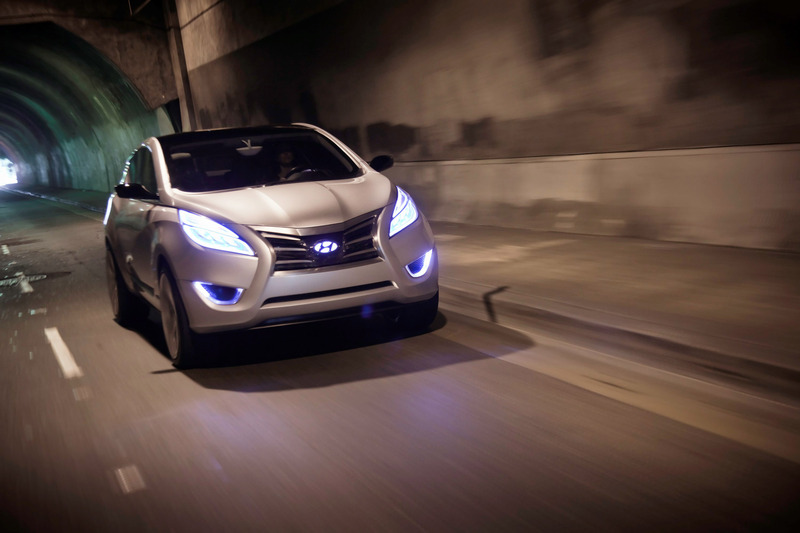 In addition to the dynamic angles and firm stance, the Hyundai Nuvis Concept boasts a host of unique exterior elements. "One of the coolest attributes of Hyundai Nuvis Concept is that the protective roof appears to float on top of the body through the use of hidden pillars and high-contrast glass," said Andre Hudson, Hyundai senior designer. "This effect starts at the headlamps and is carried all the way through to the taillights producing a tall, strong body-side and rear." Large, gull-wing doors, either opened or closed, create unique front, rear and profile views. Blue ambient lighting cast across the body adds to the overall upscale feel of the vehicle. 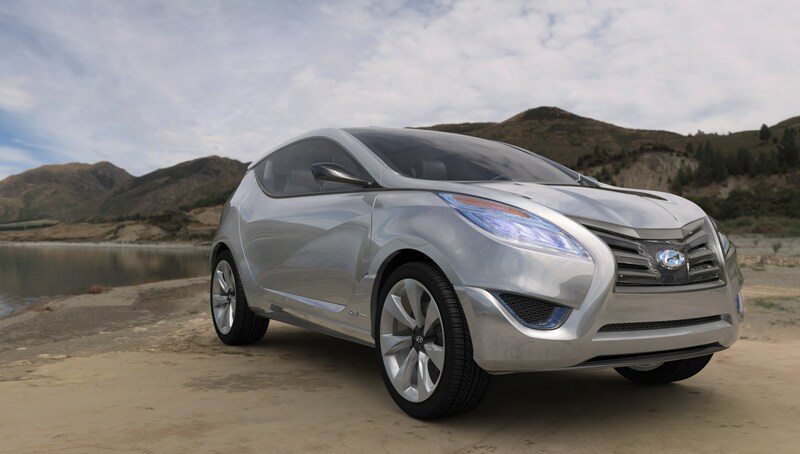 An additional design element featured on the Hyundai Nuvis Concept is a brushed aluminum accent that spans the entire length of the vehicle. Normally, this type of trim is only found around the windows. 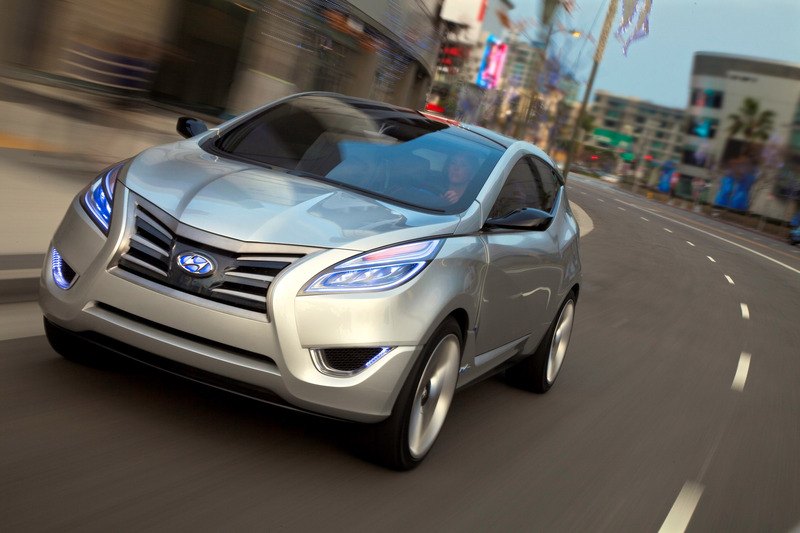 On the Hyundai Nuvis Concept, this trim extends out from the headlamps, juts up along the hood and through the beltline, across the top and into the rear spoiler. In keeping with the exterior design scheme, the Nuvis' spacious and luxurious interior is dominated by a cool, blue acrylic center stack that ebbs and surges in the manner of a river. The cascading floor, with its blue ambient lighting, further enhances an environment in which seamless technology flows, enveloping both the driver and passengers. A current of information coming from the instrument panel streams throughout the cockpit, as passengers are able to access each other via Methode Electronics TouchSense® technology that links all four business-class seats. The car's infotainment system is fed by channels from the outside - the occupants, for instance, can learn of a restaurant's specials that evening as they drive past it. The sculptured, comfortable seats are custom woven with a graduated fabric that is finished in a silver-to-black sunburst. The ecologically friendly seating fabric is provided by True Textiles, the industry's leading provider of environmentally responsible textile solutions. The Hyundai Nuvis Concept fabric is made from 100 percent post-consumer recycled polyester - reclaimed soda bottles - and increasingly sustainable manufacturing processes. Hyundai collaborated with True Creative to produce this unique fabric with an 80-inch repeat, providing a fabric that is as attractive to the environment as it is to the viewer. The matching seatbelts are provided by Harveys Original Seatbeltbags, a well- known manufacturer of handbags made out of seatbelt. 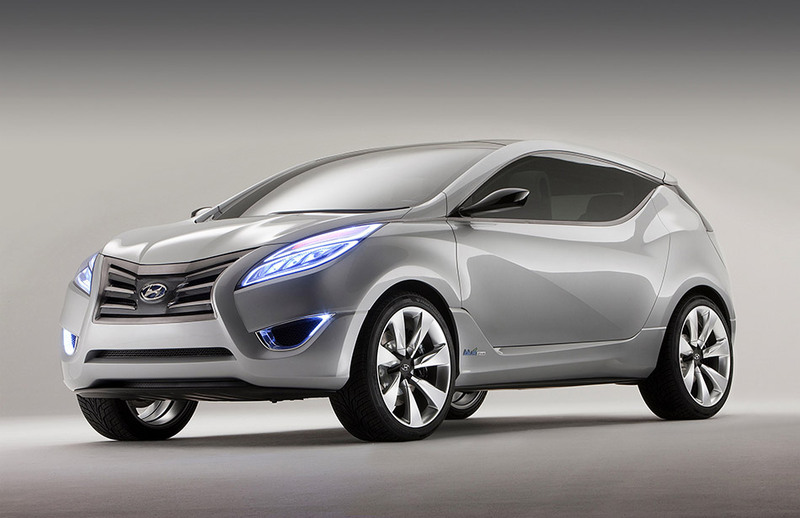 Harveys also developed two matching handbags for the Hyundai Nuvis Concept. In the rear, a high trunk floor houses the Nuvis' lithium polymer battery pack. 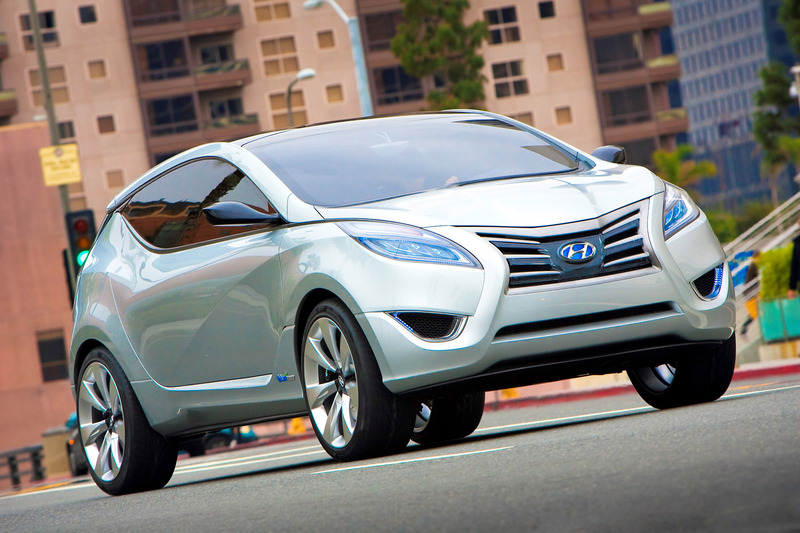 Hyundai's all-new, homegrown Hybrid Blue Drive architecture helps define the Nuvis concept. Hyundai's proprietary parallel hybrid drive system mates the already-fuel efficient 2.4-liter Theta II engine to a 6-speed automatic transmission and a 30kW (205 N-m) electric motor for maximum fuel economy. To maximize fuel economy, all of the Theta II's major driveline and cooling system components have been optimized to reduce friction, while the crankcase has been filled with low friction oil. Engine management software automatically shuts off the engine when the vehicle comes to a halt, cutting emissions to zero. The engine automatically restarts when pressure is reapplied to the accelerator pedal due to the Integrated Starter Generator (ISG). To further reduce fuel consumption, the Theta II's engine management software, which governs injection pressure, engine cycle timing and exhaust retreatment rates, has been revised. This control strategy assures that maximum efficiency is achieved during gentle acceleration, while greater power is immediately available during full acceleration. 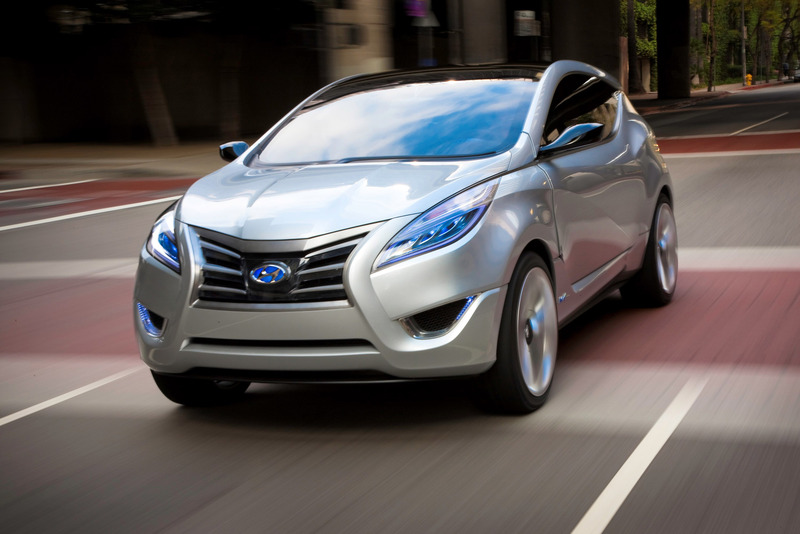 During deceleration, regenerative braking also comes into play to help conserve energy. To ensure that the engine runs at lower RPMs, the top three gear ratios in the transmission have been extended. Fuel economy is further optimized through the latest electric motor-assisted steering system which reduces power drain and low resistance tires. Hyundai's hybrid system stores its electrical charge in a 270V lithium polymer rechargeable battery (5.3Ah/270V) that surpasses both existing nickel-metal hydride and pending lithium-ion applications. Lithium polymer batteries are more durable and space-efficient than other, bulkier hybrid batteries.